Any auction can be an overwhelming experience to someone who isn’t a frequent visitor to the sales ring. An auction on the scale of the Keeneland September Yearling sale IS overwhelming, even for many a seasoned veteran. So, since the world famous auction is currently in progress on the grounds of this year’s Breeders’ Cup venue, I’ll take some time to explain some of the terminology and traditions that may be as foreign as another language for some people. Hopefully, by the end of the article, you won’t be quite as lost, and you’ll be able to enjoy watching an auction online or in-person without the frustration of not understanding a word of what you’re hearing or seeing. Working our way from top to bottom we start with the most eye-catching part of the picture: the tote board. In short, its purpose is to display the name of the auction company that the horse is being sold through, the number of the horse being auctioned, the current bidding price, and the final selling price after the hammer falls. The name of the auction company is the only thing on the tote board that will never change throughout the course of the sale. The two lines directly below the name are spaces that will display any important information that the buyers should be aware of like the horse being a cribber, or a ridgling, and if a mare is pregnant. Mishearing something is very common, so this aides in the elimination of the issue that a buyer is bidding on a horse that they heard is one thing but he/she is actually another. The voice you hear, the really fast one that you probably can’t understand, is the auctioneer. He’s the one that drives the price on the tote board. What he says is what will appear and once his hammer falls, the price is final. In the ring, the person holding the horse is a specially trained/selected handler. Many sales work with a select group of trusted handlers, and why not? It is much easier to hand over a horse to someone that you trust and respect with the knowledge that your horse could sell for a few million than it is to someone that you’ve never seen handle a horse before and is a brand new face. They will also swap out at some point during the sale session, and are there to show the horse in the ring. The people that you occasionally hear the auctioneer talking to are the gentleman on the floor standing right in front of the podium. They are the bid spotters. Those that are there to buy a horse don’t actually alert the auctioneer to their intent on bidding for a horse; they alert the bid spotter who then signals that he has a bid. If the owner that he is spotting wins the bid, the bid spotter will then walk over with a clipboard to the lucky party and have them sign the ticket for that horse’s HIP number. They are also usually the ones that goad people into spending more than they originally had planned on doing and the bid spotters all have a unique “style” to their persuasion. Some are aggressive in their reasoning and others might guilt you into bidding more. At a quick glance, would you be able to tell that the horse on the left is American Pharoah and the one on the right is Beholder? What if a new buyer was just now getting into the game and wanted to buy Beholder for her broodmare band but ended up looking at American Pharoah before the sale instead of Beholder because she left her glasses in her seat at the pavilion on accident? What if, in the rush of the sale, a handler that doesn’t usually work with American Pharoah or Beholder, is asked to take Beholder up to the ring to be sold but he grabs Pharoah instead? 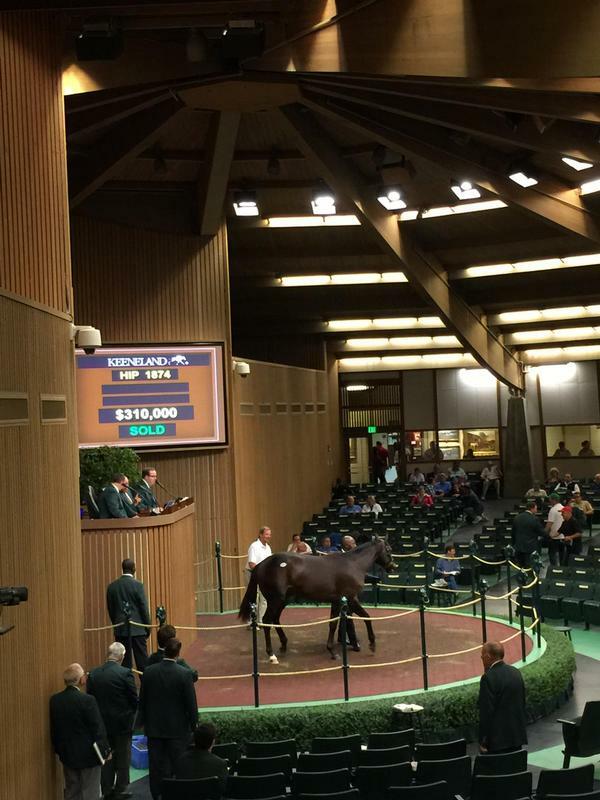 Now, Pharoah is being sold as Beholder and the poor woman who left her glasses in the pavilion before is now bidding for a horse she believes will be bred to Curlin next year for a foal to sell in the autumn of the following year. This is all a theoretical over-dramatization, but HIP numbers are in place to avoid just that situation. It helps organize the young horses who have yet to be given a name in a catalog. It prevents two horses that look alike for being mistaken as one another. It helps foreign buyers that are experiencing an American auction for the first time better recognize which horses they are bidding on. -Cribber: some people call them “wind suckers” but these horses could not only cause damage to wooden structures, but could also cause some internal problems for themselves. Many owners have a negative astigmatism against cribbers, so auction companies report if a horse is a known cribber before selling them. -Ridgling: a male horse that has one or both testicles that haven’t descended yet. Whether or not it affects a stallion’s breeding abilities is debated as plenty of stallions have had successful breeding careers such as the legendary A.P Indy, one of the most famous ridglings. That settles the first part of the auction post. I’ll have more terminology next week!